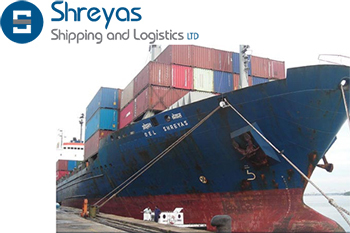 Shreyas Shipping & Logistics Ltd is currently trading at Rs. 322.5, up by Rs. 16.1 or 5.25% from its previous closing of Rs. 306.4 on the BSE. Shreyas Shipping Ltd has announced that it has added 9th Container Vessel MVSSL Visakhapatnam to its fleet. The scrip opened at Rs. 307.2 and has touched a high and low of Rs. 326.8 and Rs. 304.8 respectively. So far 37988(NSE+BSE) shares were traded on the counter. The current market cap of the company is Rs. 672.85 crore. The BSE group 'B' stock of face value Rs. 10 has touched a 52 week high of Rs. 839.5 on 05-Aug-2015 and a 52 week low of Rs. 133.1 on 17-Feb-2016. Last one week high and low of the scrip stood at Rs. 315 and Rs. 301.2 respectively. The promoters holding in the company stood at 73.25 % while Institutions and Non-Institutions held 1.18 % and 25.57 % respectively.